Homepage. This page: Old advertising artwork for William Lyons' Jaguar Cars. Another period piece of artwork sent in by Les from his own collection, this time featuring the classy cat from Coventry. Sadly, cars are no longer produced at Browns Lane, and Jaguars are now part of the American Ford empire, along with Aston Martin, Volvo et al. When the Mark V was current however, Jaguar was British through and through, and thoughts of being owned by Ford wouldn't have crossed the management's mind. As with some other pictures on the site, I think this would have been used in contemporary advertising, perhaps in the motoring magazines, or in factory-produced sales literature. When was the Mark V produced? The swoopy Mark V was built at Browns' Lane in the early post-war years, from 1948 through to 1951. The Jaguar was available as either a graceful 4 door saloon (as shown above), or else as a 2 door, drop head coupe. The 3 position DHC model is a rare motorcar nowadays. Engines, of either 2.5 or 3.5 capacity (both 6 cylinder), were carried over from the previous SS models and used in all Mk Vs. The introduction of this model heralded a number of new features, featuring independent front suspension (leaf spring rear), hydraulic drum brakes, and the unusual fitment of flush-fitting, push-button, door handles. The front doors were of the 'suicide', rear hinged, layout. The company once known as S.S., was renamed as Jaguar Cars in 1945, Jaguar being a pre-war model name in the S.S. range. 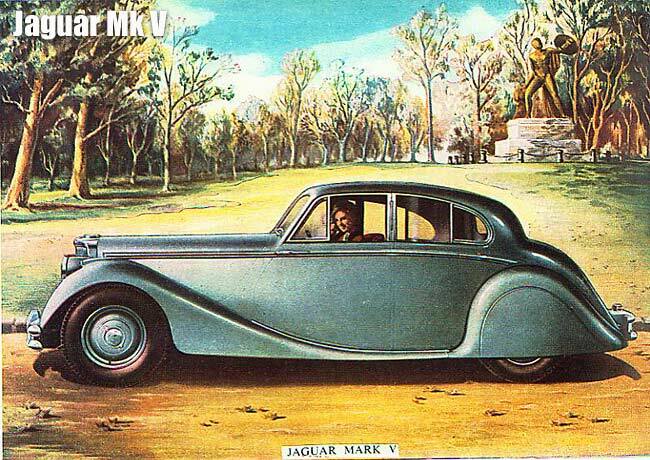 The Mark V was really a stop-gap model, until production of the all-new Mark VII could begin in 1950 - delays with Pressed Steel supplying the bodyshells was the main reason for the delayed launch of the VII. The V took many of the styling cues of the pre-war S.S. cars, and refined them a little in line with contemporary styling trends, including the fairing in of the headlamps into the front wings. The chassis was however new for this model. The final Mark V left the production lines in June 1951, after which 10,466 examples have been produced. The XK powered MkVII took over in the Jaguar showrooms from then on.